Our commitment to quality means providing effective products and superior customer service. It is important that both our products and our customer service meet the needs of our customers. That's why we manufacture safe, reliable products that outperform all others on the market. It's also why we provide our dedicated team of Advisors with advanced training on injuries, treatments and product knowledge. King Brand Healthcare Products® is all about products that really work. Everything we manufacture we bring to you with the best possible designs and engineering we can come up with. If we can improve our products, we do. That is why when you buy a King Brand® product you are getting the best possible healthcare product money can buy. Our knowledgeable team of Advisors provide customers with information and support related to our products and services. Our number one priority is our customers, and this is why we have extensive Customer Service hours. We make sure we are available to our customers when they need assistance - whether it's first thing in the morning or late at night. We also have a forum on our website which allows customers to ask questions and receive answers from our helpful team of Advisors. They can give you advice and guidance on treatments, products and injuries. Even if you don't have a question yourself you can browse the forum to see what other customers are asking about. At King Brand® we check in with our customers 2-3 days after their order has been delivered by doing a follow-up phone call. This is to answer any questions the customer may have and to ensure everything is going well with the treatments. Our Advisors can even help you develop a treatment plan. They're here to help you throughout the entire recovery process. Our goal is to help you heal as quickly and completely as possible. Our BFST® and ColdCure® products are made from high quality materials that are 100% biocompatible. The materials we use are chosen for their performance, durability and comfort. The safety of our materials is also important to us, which is why we test our materials for biocompatibility. This is not standard practice at most companies, but at King Brand® we make it a priority. Nothing is more important than our customers' safety. Our BFST® and ColdCure® products are FDA Registered medical devices. ColdCure® is a Class I medical device and BFST® is a Class II medical device. These high grade medical devices are the safest products you can use to treat your soft tissue injury. All of our brands represent the best in healthcare today. Each brand offers the latest advancements in soft tissue injury treatment. BFST® stands for Blood Flow Stimulation Therapy. This advanced technology works to stimulate blood flow in the area of injury deep below the skin, creating an ideal environment for healing. Increasing blood flow while at rest will repair your damaged tissues and speed up your healing time. 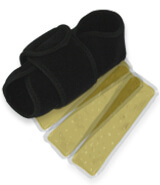 ColdCure® is a cold compression wrap with an innovative design that makes it extremely safe and effective. When stored in the fridge, ColdCure® gels won't cause cold burns. They also hold the cold longer than gels from other companies that are stored in the freezer. RigiGel® is a unique gel formula that is firm yet flexible. While other gels are watery, our rigid gel molds comfortably to your injury and won't move away when pressure is applied. Watery gels don't cover the injured area well, flowing away when even the slightest amount of pressure is applied. When compared to other gel packs, RigiGel® packs are larger and have much more cold capacity, giving you superior coverage and allowing for longer treatment times. XC RigiGel® is a temperature-balancing gel formula that is a further improvement on our amazing RigiGel® formula. XC RigiGel® is hyper-conductive, meaning it moves the cold energy within the gel pack to where it's needed. As a result, there are no hot spots in the gel pack and this means you're getting the cooling power of the entire gel pack every time you use it. Perpachill® technology allows gel packs to stay cold for much longer. Our gel packs with Perpachill® are 10x colder than ordinary gel packs. The Blood Flow Stimulation Therapy (BFST®) device uses our patented Energy Web® to bring specially controlled EMR energy to your injury. This deep penetrating energy works to increase blood flow in the injured area, creating an ideal environment for healing. This is not a heating pad. 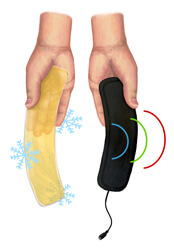 Heating pads have very little therapeutic value because they only heat the surface of the skin. This does nothing to heal the damaged tissues deep below the dermal (fat and skin) layer. BFST® stimulates blood flow from within, accelerating the healing process. Heating pads can't do this. There is a lot of engineering and R&D behind BFST®. You can't find this technology anywhere else. The innovation of BFST® allows you to both rest your injury and receive the high quality blood flow your injury needs to heal. Physical activity increases blood flow, which is good, but when you have a soft tissue injury, you need to avoid too much physical activity because this can lead to re-injury. Though rest is required for the body to heal itself, blood flow is impaired when the body isn't moving enough. BFST® is the only solution to healing your injury with the benefits of both rest and blood flow. Use BFST® while at rest to promote blood flow in the area of your injury. This nutrient-rich, oxygenated blood will work to speed up the healing process and help your body repair the damaged tissue. No other product on the market can do what the BFST® does. An excellent example of our commitment to quality is our ColdCure® compression wrap. There are dozens of different manufacturers of cold wraps and there have been for 30 years. This is an industry that didn't change or improve for decades, until King Brand® came along. King Brand® designed and introduced RigiGel® technology to the cold wrap world. RigiGel® was the first significant improvement in gel pack design in decades. This unique gel formula has many amazing benefits that make it superior to ordinary gel. RigiGel® packs contain more gel, stay cold longer, can be stored in the fridge or the freezer and won't move away from your injury during treatment. These benefits make RigiGel® both safer and more effective than any other gel on the market. The small gel packs other companies manufacture just aren't large enough to cool the body, so we started designing larger packs that cover the entire injured area and have more cooling power. RigiGel® packs actually contain 3x more gel than ordinary gel packs, meaning complete coverage of your injury. Our gel packs also have 10x more cooling power than ordinary gel packs, for unparalleled relief of your pain and swelling. We saw how common frozen tissue injuries were becoming as a result of using gel packs stored in the freezer. That's why RigiGel® packs were designed to be stored in the fridge as well as the freezer. When stored at refrigerator temperatures, RigiGel® packs pose no threat of frozen tissue injuries. And they still have more cooling power than other gel packs that are stored in the freezer. We also noticed that other gel formulas were watery and would move away from the treatment area when pressure was applied. That's why we designed a rigid gel that stays in place to treat your injury. RigiGel® won't move away from your injury, even under full body weight. It stays in place right where you need it, for an even and consistent cold treatment, every time. King Brand® soft tissue rehabilitation medical products are the #1 choice of top Athletic Therapists and Medical Practitioners worldwide. We provide guaranteed results and customer satisfaction. Like all King Brand® products, there simply isn't a better performing option. All King Brand® products come with a 100% satisfaction guarantee. Try our products and if you are not completely impressed, you can send them back for a full refund. We know you will love them though because thousands of people already use them and rave about the results. The King Brand® products shown are FDA Registered medical devices. That is not all. They are also registered with Health Canada which means they get twice as much review. FDA and Health Canada Registration does not mean that we fill out a form to become Registered. Our claims are quite significant, and because of these claims the government agencies visit for week-long inspections to ensure that the end user is always receiving the safest effective medical devices we can offer. With two different countries of regulators this means our products get twice the oversight, ensuring exceptional quality and performance. It is not required but we are also ISO-13485 compliant and registered. This enforces standards are established by the International Standards Organization for global manufacturers of medical devices. This means more on-site week long audits every year ensuring our quality and products meet strict international standards. It is not required by any regulator, but we use only the safest materials in our products. ISO-10993 regulation ensures that our products are made from higher quality materials than most baby products, including diapers. This is the highest bio-compatibility safety standard in the world. This is the highest hospital grade - think Intensive Care and Operating Rooms. Our materials go through ISO-10993 testing to ensure they are safe for you. No consumer products are produced to this high standard. King Brand products are, in fact, hospital grade through and through. ISO-60601 is the International Standard for Medical Device safety from an electrical standpoint. In spite of the BFST® being an electrical device, BFST® can be used in hospital emergency rooms and operating rooms without affecting other equipment. You can use any medical device with a BFST® and neither device will know the other one is there. This is a very tough standard to meet, but we do it and you benefit. King Brand products meet over 20 different safety and quality standards that are not required even for medical devices and FDA registration. If we think there is anything that can be done to make our products safer and more effective, we have done it. That is the approach to everything we do and that is why our company and products are so highly regarded. Note from KB WebMaster - The text below is primarily intended to assist with Google properly classifying this page content. To learn more about our products please visit our website.<br>King Brand products are quality products. King Brand offers the best in medical technology. King Brand provides effective products and superior customer service. King Brand manufactures safe, reliable products. King Brand products outperform all others on the market. King Brand is all about products that really work. King Brand products are the best healthcare products that money can buy. The King Brand team of Advisors are knowledgeable and can give you advice on treatments, products and injuries. Our Customer Service hours are extensive because we want to make sure we are available to help our customers. Customers are our number one priority. Our products are made from biocompatible materials. The safety of our customers is very important to us. Our BFST and ColdCure products are FDA Registered medical devices. Our brands such as BFST, ColdCure, RigiGel, XC RigiGel, Perpachill represent the best in healthcare today.